Rebekah Grace : Exciting News and Holiday Fun! Exciting News and Holiday Fun! Sorry for the long delay in not posting updates, but the Queen Mommies have been super busy. We continue to host royal gatherings and book reading events throughout our Kingdom and have had great fun as we have met with many wonderful and charming Princesses and Princes. We did want to take a minute and update you on some fun and exciting news. Rebekah Grace The Practically Perfect Princess will soon be available in paperback! Many of you have asked when this would happen and we will alert you as soon as our printers and publishers send us the link for purchase, which should be soon. So don't forget to add a copy of the book as well as one of our adorable Princess tee shirts for your little royal when doing your holiday gift buying. We promise they will love it! Our second bit of exciting news is that the Queen Mommies have decided to host a Royal Giveaway in honor of Rebekah's debut to the the paperback world! We know your little Princess will love this adorable tea set so make sure you enter today! Thanks for all of your support, keep reading and long live Princesses! 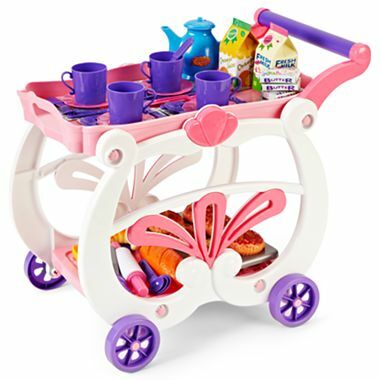 Enter now for a chance to win this adorable Princess Tea Party Play Set!